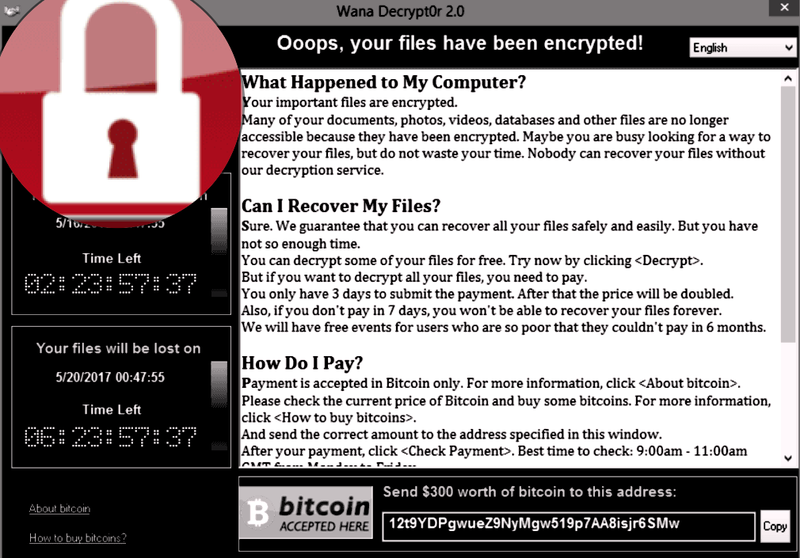 On Friday, 12 May 2017, a large cyber-attack using it was launched, infecting more than 230,000 computers in 150 countries, demanding ransom payments in the cryptocurrency bitcoin in 28 languages. This type of malicious attack is classified as ransomeware. The ransomeware concept is fairly simple. Once the package infects a system, it begins to encrypt all the data. The data is still on the machine, but it is not accessible unless the user enters a decryption key. In order to obtain the key, money must be sent to the “owner” of the ransomeware. Usually this money is requested in the form of cryptocurrency, to make it difficult (if not impossible) to trace the payment. Schools often believe that certain security measures and protocols followed in the corporate world do not apply to them. There is often a consensus on-campus that technology needs to be friendly and open. Because of this cultural approach to planning technology many rules and regulations are simply not followed, especially if those rules and regulations are designed for extreme scenarios. For example, it would be odd to find a school that did not have user managed passwords for email. When users get their email account, they change and manage their own password. However, if someone recommends that school personnel setup multistep authentication, that expires every thirty days, that recommendation is probably going to be rejected. Any multistep authentication process requires that users learn more about security and manage security more regularly. If a user makes a mistake, the delay for resetting their services is often considered unacceptable. IT policies and procedures that would prevent a school from being a victim of ransomeware, or other sophisticated attacks, are going to be policies that create barriers and limits. These measures would slow people down at times, and restrict certain types of technology from being used on-campus. This entry was posted in Helpful Tips, Instructional Technology, TIEONLINE and tagged hacking, Ransomeware, security. Bookmark the permalink.